Soda. Soft drink. Fizzy water. Pop. Cola. Whatever you call it, we like it. Despite reports of dwindling soda sales across the board, we’ve always got a soft spot for an ice cold carbonated beverage. This week, we step up to the tasting table with our resident carbonation connoisseur, Holly, to test drive some favorite flavors of the bubbly beverage. Americana Huckleberry Soda Harkening back to simpler days of cobbler, pie, and picking fresh berries off the bush. The Americana soda line captures the essence of Idaho’s state fruit: the huckleberry. The initial aroma transposes the distinctive tartness of huckleberry that might promise a bit more than the actual taste delivers. But the mellow and authentic flavoring round out a well balanced soda. Frostie Blue Cream Soda “Why is it blue?” “Is it some sort of marketing ploy?” “Will it turn my teeth blue?” Oh. It’s just cream soda. There’s blueberry in there somewhere, apparently. Bundaberg Lemon Lime & Bitters This family-owned Australian company’s nod to the classic LLB cocktail (Lemon + Lime Cordial + Angostura Bitters) delivers in full as the most spirited of the bunch. Complex, not-too-sweet flavoring provides a solid autumnal crisp. This one’s a sipper. Scotty’s Butterscotch Soda Despite the image of an actual stick of butter on the label, Scotty’s Butterscotch Soda falls on the creamier side of butterscotch. An incredibly strong, buttery aroma teases a much desired salinity, but alas, we’re met with a mellow sweetness from the start to the exceedingly clean finish. A great choice if you prefer a butterscotch soda that doesn’t linger. Frank’s Lemonade It’s got the cloudy look of the real fresh-squeezed favorite. This fizzy lemon juice is sweet through and through with little to no bite. The sweetness ushers in intense feelings of nostalgia for waning afternoons at the county fair, as the sun dips lower and the ferris wheel lights start to blink. Dry Lavender Soda The dry is no lie. Actually, it’s in the name. Dry Soda Co.’s lavender soda’s got just a hint of the purplish flower, meaning you can smell it more than you can taste it. Perfect for cocktails and mixed drinks, Dry Soda recommends pairing with cheese courses, pork, roast duck, desserts, and chocolate. In cocktails, mix with vanilla vodka, gin, and Frangelico. Fentimans Rose Lemonade *Sommelier’s Pick* Brewing botanicals in Hexham, Northumberland, UK, Fentimans has somehow brewed a carbonated concoction that smells like a trip to your gram’s house. Heavy rose on the front end with a gentle fizz to stimulate the mouth feel. Not too much bite, but the lemon adds a layer of complexity to the easy rose sweetness. It’s a June afternoon. Americana Honey Cream The bees themselves could not have bestowed upon us a better gift. Just as good as the name implies, a honey top note buzzes by, carrying heavy sweet cream in tow. Perfect in a frosty mug with a scoop of vanilla bean ice cream and a drizzle of your favorite local honey. 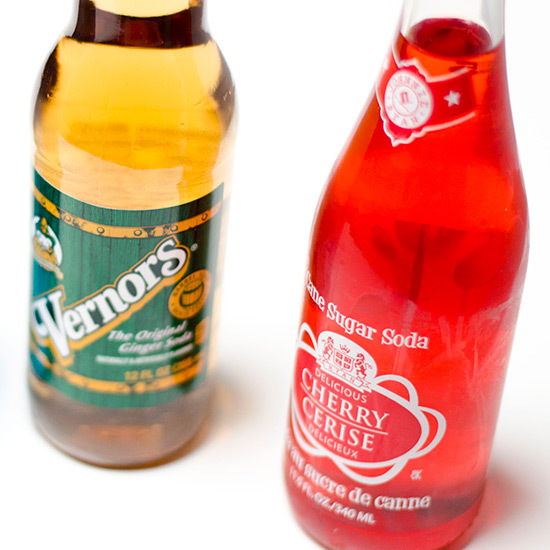 Vernors Ginger Soda Crafted in Michigan since 1886, Vernors is the ultimate in easy ginger soda consumption. Sweet and easygoing, the carbonation is highlighted by the spice of ginger that sits far back on the pallet. A great alternative to citrus sodas and colas, but in a completely different category! Best served cold. Very cold.